I’m a sucker for sausage. I just love putting a fresh hot sausage in my mouth and devotedly puncturing its skin with my teeth until the heavenly juices squirt out all over my tongue. And when I got it all in my throat I’ll swallow it down and get myself another, even bigger sausage. Seriously though, Brandt & Levie know how to make worst like no other, and they’re celebrating it at The Worst Day of the Year, this Sunday. And worst won’t be the only thing to feast on at this guerrilla food festival; there’s gazpacho from tomatoes saved from the trash, pigs on spit roasts, home-made bio beers and ciders, and none other than the all-vegan Dutch Weed Burger. 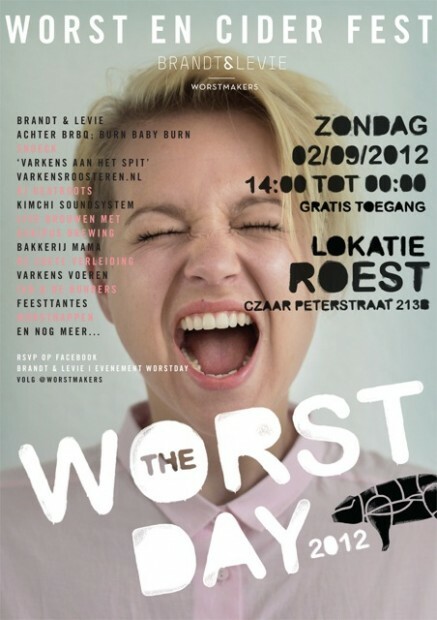 All of this will take place in and around Amsterdam Roest, all day from 14.00 till 00.00. Entrance is free, the sun might come out, so bring your girl and get some cider inside her. As my grandma used to say: she won’t mind you minding the worst as long as you keep her from having dorst.